En revanche, le rythme est terriblement pédestre, ce à quoi le montage du tac au tac tente de remédier, avec plus ou moins de succès. Petite comédie charmante, Rules Don't Apply ne semble pas avoir d'autre objectif que de donner à l'Amérique un peu de rêve. Il s'en dégage un parfum de nostalgie qui risque de ne plaire qu'aux amateurs. 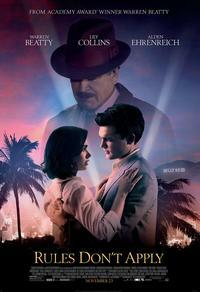 Warren Beatty certainly took his time in getting this sprawling Spruce Goose of a movie off the ground, as the romance distracts from the Howard Hughes portrait, or vice versa. Actor-director's long-awaited drama about young romance and old Hollywood is outshined by his take on reclusive billionaire. Rules Don't Apply proves that the man they used to call “The Pro” hasn’t lost his touch. There's some beautiful visuals and individual moments that can be seen be enjoyed, but if you're looking for a plot that makes sense, you may want to apply elsewhere. But Beatty uses it far too much, seemingly dropping the needle on the track whenever he wants to stir a little emotional melancholy on behalf of the two young leads. There’s a Howard Hughes biopic and a lovely Hollywood romance going on here, but they never quite cohere enough to make one movie between them. After the screening I heard a fellow critic say, "I have no idea what to say about that movie." I'd like to think that if Beatty could've heard that, he would have thought, "Victory."